Hi crafters! Today is challenge day for Cricut Cardz over at Cardz TV. This week's challenge is to make a Valentine's Day cards using any cartridge or colors that you like. For my card, I used the Better Together cricut imagine cartridge. I just love the images on the cartridge. I used a sketch from Card Patterns to make this card. I love using sketches because it takes the guest work from making your card and your hardest decision is to decide which stamps and die cuts to use. 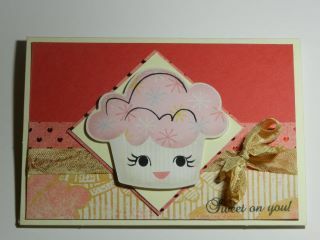 Also, I used the Sweet Talk stamp set from Cardz TV Stamps. Don't forget to hop over to Cardz TV to participate in this week's challenge and get inspiration from my other DT members. Thanks for stopping by! Yummy sweet. Have a fun, creative day!